At Froggy's, we strive to provide the finest selection of quality hard-to-find merchandise available. Our suppliers take great pride in their products. Many began making their products as a hobby never dreaming that they would be in such demand. Some of their stories are so interesting that we wanted to share them with you. Twenty Two years ago, a little nervous (a lot nervous?) about asking Melissa to marry him, Doug first asked her to start a company with him. 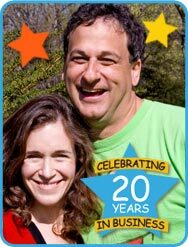 Melissa and Doug started their company in the garage of the home where Doug grew up — They had to be careful not to disturb Doug's parents who were still living there! Thanks to their attention to detail, extraordinary products and loyal customers, they have been able to move into an office down the road - a real building with doors, actual windows and even a lunch room! From puzzles to puppets, plush toys to play food, magnetic activities, music and more, Melissa & Doug® is one of the leading designers and manufacturers of educational toys and children's products. Started in 1988, Melissa & Doug® has something for everyone, with nearly 1000 unique and exciting products for children of all ages! Here are some of Melissa and Doug's Awards! Melissa & Doug's philosophy has remained the same over the years – to make each and every customer a happy and permanent member of the Melissa & Doug® family, while offering products with tremendous value, quality and design. Froggy's is proud to offer the full line of Melissa & Doug® products. We are sure they will bring many hours of fun for children of all ages. 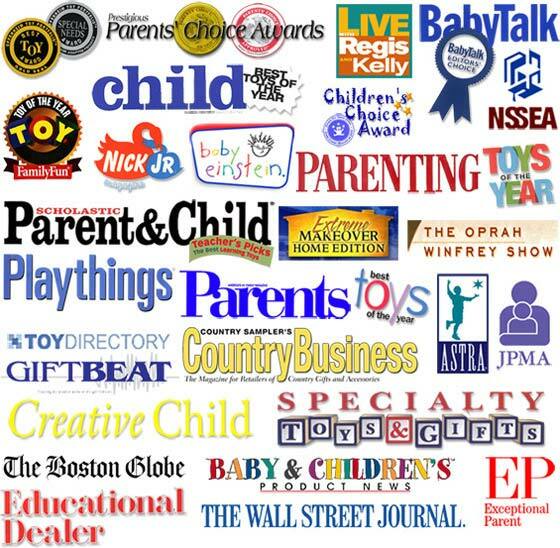 Melissa and Doug are pleased to tell you that YES, Melissa & Doug® products are compliant with the new Consumer Product Safety Improvement Act (CPSIA) regulations. "From day one, we have had a comprehensive testing program in place for all of the products we produce and sell. Our testing programs have always been in compliance with all US consumer product safety regulations, and we will continue to stay compliant even as some of these laws evolve and change." "As a result, you can continue [using] our products with confidence knowing our products comply with the new total lead standards imposed under the CPSIA that became effective February 10, 2009. Of course, we also have General Conformity Certificates readily available for products produced after November 2008 as required under the CPSIA guidelines as further assurance of our products’ compliance to CPSIA." Snoozer began business in South Carolina in 1985, and is still headquartered in Greenville, South Carolina. 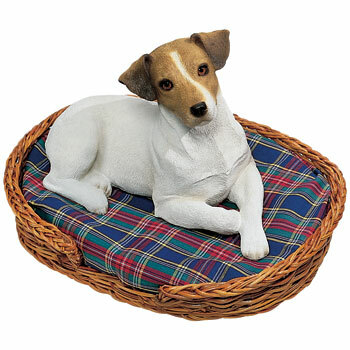 A genuine American company, Snoozer is family owned and operated, and manufactures the finest pet beds, dog sofas, and pet accessories on the market, at prices you can afford. 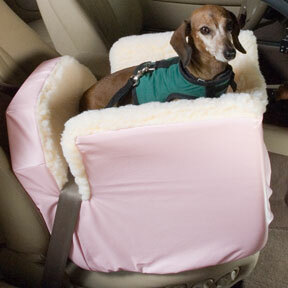 Furthermore, Snoozer's Lookout dog car seat offers one of the most comprehensive pet car safety systems on the market. Your pet can rest assured with a Snoozer car seat, backed with Snoozer's one year limited manufacturers warranty. Because today’s pets are considered part of the family by a lot of folks, Snoozer Pet Products are designed to blend easily with almost any home décor. Give your pet the long-lasting comfort you know they deserve. Whether at home, by the pool with an outdoor dog bed or when flying and in need of an airline approved pet carrier, Snoozer offers a wide variety of beds, car seats and accessories for your dog or cat. TRAIL OF THE PAINTED PONIESGiftbeat Magazine, which tracks the product pulse of the gift industry, has awarded The Trail of the Painted Ponies the distinction of Number One Collectible! These miniature works of art are "gifts that are worth giving all year long", bridging the gap between Fine Art and Collectibles. From Main Street to Museums, critics and collectors are raving about the Trail of the Painted Ponies. Featured in major media including CNN, ESPN, PBS, Southwest Art Magazine, Cowboys and Indians, Philanthropy Magazine and many prominent newspapers. 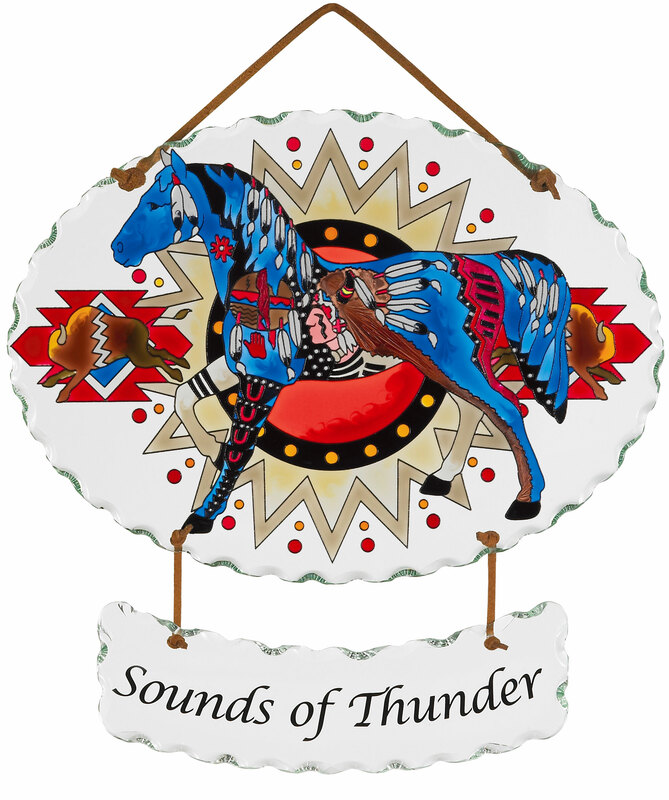 Winner of two White Sands Film Festival Awards, the Trail of the Painted Ponies documentary film continues to enchant collectors. JOAN BAKER ART DESIGN GLASSInnovation and creativity at its best! 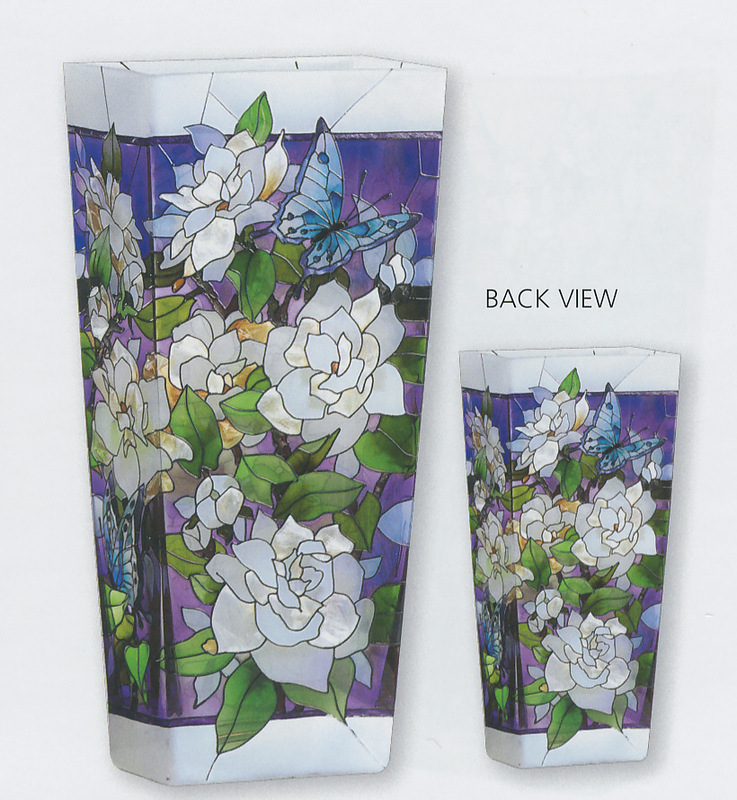 Founded in 1975, Joan Baker Designs is THE major supplier of hand-painted art glass gifts and home accessories. People ask, Is there really a Joan Baker? Yes, there really is! Joan's career began when she started creating unique gifts out of salvaged bits of broken glass and moved on to become the founder of the top-selling giftware line. Joan grew up in Hong Kong and Taiwan, the daughter of missionary parents. At age 17 she came to the United States - alone - and earned her way through college with a variety of jobs like picking beans and selling vacuum cleaners door-to-door. In 1975 Joan started her business with a borrowed $50.00. With help from her sister and neighbors, she hand painted glass at the kitchen table. In 1980, Joan Baker Designs moved into its first leased building in San Clemente, California. As sales boomed, Joan hired and trained Marine Corps wives from a nearby military base and provided badly needed jobs to Southeast Asian refugees arriving in Orange County. By 1995, Joan had opened her 65,000 square foot factory in China and built a new facility in San Clemente. Today Joan Baker Designs is one of the leading giftware companies in America. 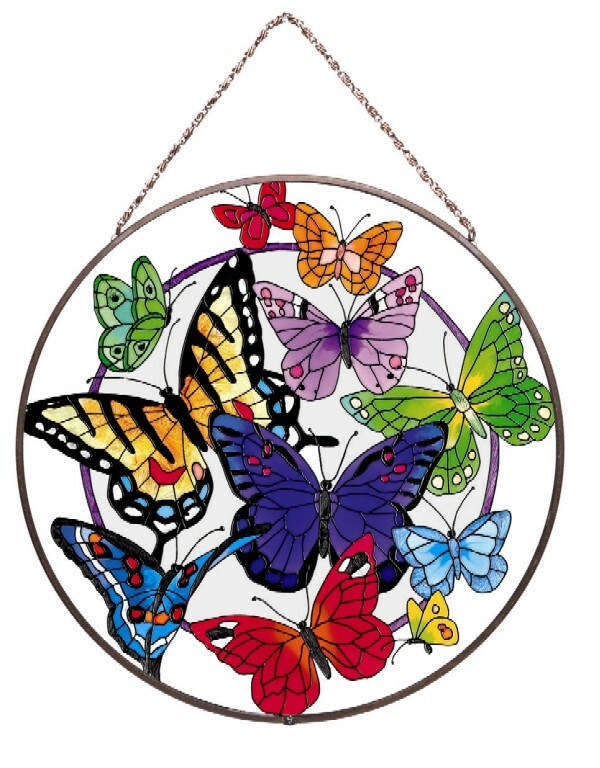 All Joan Baker Designs are hand painted on glass. No two are exactly alike. You can be sure that your Joan Baker Design is truly one-of-a-kind. - Some Joan Baker products may contain lead. Which ones? ONLY the ones with the traditional dull GRAY metal. These are pimarily suncatchers and night lights. The black, silver or colored lines on the glass do NOT contain lead. Joan Baker products are not intended for internal use nor should you eat or drink from them. THE BEARINGTON COLLECTION® Froggy's is proud to feature the Bearington Collection®. Bearington, a relative newcomer to the Collectible Plush Industry, has made quite an impression on plush collectors around the nation and internationally as well. Bearington has received numerous awards including TOBY (Teddy Bear of the Year) Industry Choice Awards, TOBY Public's Choice Awards, Golden Teddy nominations, CIB Collector's Choice Awards and Canada's Collectible of the Year Award. 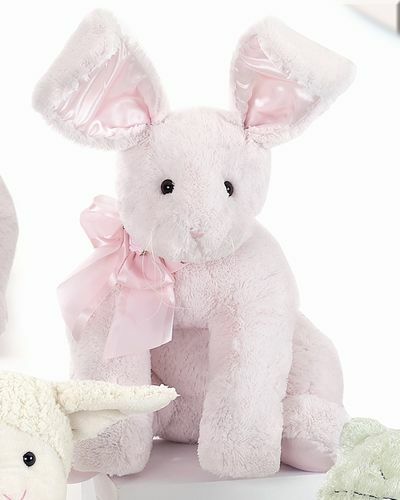 Bearington is rated one of the fastest-growing plush companies in the industry. The love of Teddy Bears drew the Stray family to the industry early on. After working in sales for a number of respected industry leaders, they finally realized their dream of owning their own company. Betty (the mother) and Jamie (the daughter) are the company's primary designers. Artists by nature, they are always creating new designs. Jim (the father) and Brad (the son) are responsible for the general organization and operation of the company. The unique collaboration of designers and organizers combined with the care, dedication and pride that only a family owned and operated business can offer is what makes Bearington Collection® what it is today. 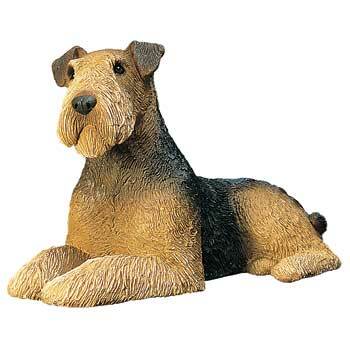 Sandicast, Inc. of San Diego, California is THE premier manufacturer of hand-cast animal sculptures. 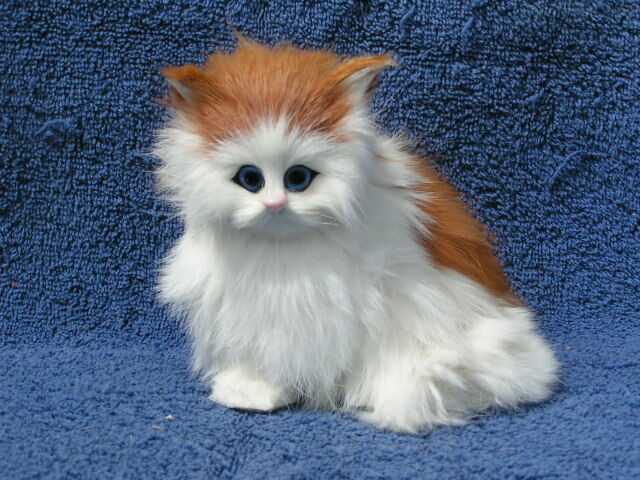 In 1981 when Sandra Brue, a graphic artist for 12 years, combined her artistic talent and her love of animals and began sculpting life-size animals in her garage, little did she know that within a few years, Sandicast® Animal Sculptures would be coveted and collected worldwide. Sandra studies and works with live models, using her unique style to capture not just the appearance but the personality, spirit and character of each animal. In her passion for perfection she often spends months working on a single piece painstakingly sculpting every detail. She sculpted 65,358 individual hairs, one at a time, on her original Jack Russell Terrier. Sandra uses an oil based clay that does not harden allowing her to spent the countless hours required to capture every exquisite detail. A casting mold is made from the original and a special cast stone mixture is hand-poured into it. The sculpture is then hand-painted using both brush and air-brush in a process requiring several steps. Strict quality control measures are followed throughout. “Each time I go to sculpt a dog I study up on the breed’s origin and how they have evolved over the years. Many breeds did indeed have a job and were and still are an essential part of many cultures. They are also the most difficult for me to sculpt. No other animal has standards or expectations for what is considered ‘correct’ in a breed. When I sculpt a Rhino, no one is going to say that the distance between the two horns is not correct or the the giraffe’s neck doesn’t look like my piece." Artist Sandra Brue’s Sandicast Sculptures adorn the homes of Presidents, the Queen of England and collectors worldwide. In 1994 she was commissioned to create the Lion King collection for Disney. Sandra carves her name, “BRUE” on each piece. Look for it to be sure you are acquiring an authentic Sandicast Sculpture. "Sandicast®" and "Sandra Brue®" are registered trademarks of Sandicast, Inc.
Our lifelike furry animals are so realistic that people can't resist petting them. 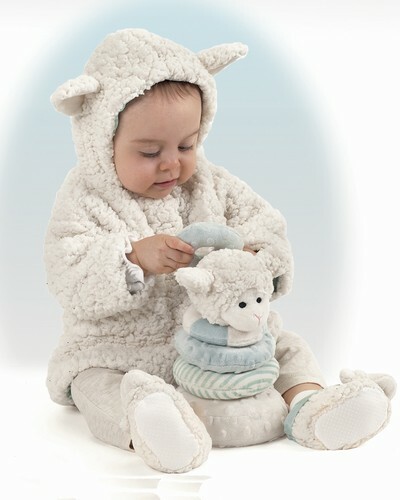 All our furry animals are hand made with real fur from rabbits, sheep or goats. First, plastic models are made for each animal. Then selected sheep, goat or rabbit fur is glued on. If the animals have stripes or colored spots, different dyed furs will be used together. All of the furs come from animals raised on farms for their food value. If their fur had not been used to make these beautiful animals or other products it would have been thrown away. 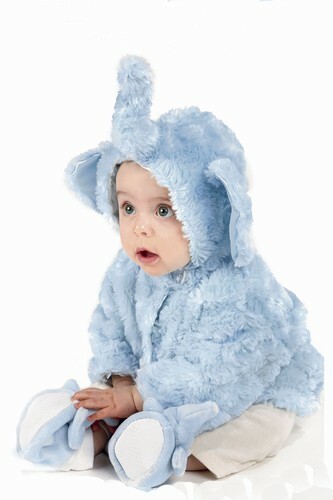 Please note that the Furry Animals are NOT intended for babies or very young children who might put them in their mouth or try to eat them. Unique Shapes and Beautiful Colors!! William K. Turner has produced Raku fired ceramics for over 20 years. His work has sold throughout the United States and includes over 120 shapes and sculptural pieces, finished in several unique Copper Matte techniques. He is a Master at getting both light and dark colors in his Raku from his one specially formulated Copper Matte glaze. William Turner is Raku Art. He decided a long time ago that doing Raku was more fun than throwing or hand-building clay pieces. By using molds and slip casting them he can produce a large variety of unique shapes. Each piece is signed, dated, and comes with a card explaining the Raku process. As William Turner says, "Each piece is unique, I will remove pieces ordered and add new work often." Outstanding colors and patterns over the whole piece are the trademark of Raku Art Inc.
William K. Turner has formulated a Copper Matte Raku glaze that is one of the best you’ll ever see. The velvet shimmering colors range from copper reds, cobalt blue, and purples to the lighter pastels of teals, pinks, and gold’s. 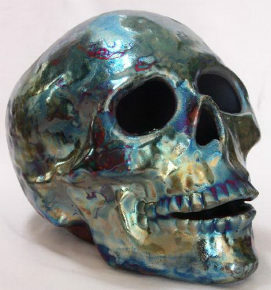 He uses this one glaze in combination with gloss glazes to get many metallic textures with his unique glazing techniques.